Run by the Society for Children and Youth of BC, the Child and Youth Legal Centre has two full-time lawyers and is developing a province-wide roster of lawyers, all of whom can represent children where their voices might otherwise not be heard. In this eNews Suzette Narbonne, one of the Centre’s lawyers, describes the centre’s background and work. “The work of the Centre is informed by the United Nations Convention on the Rights of the Child (UNCRC), the world’s most ratified human rights treaty, which affirms that a child who is capable of forming his or her own views must be assured “the right to express those views freely in all matters affecting the child” (Article 12, UNCRC). In order to ensure this right, Article 12 mandates that the child shall “be provided the opportunity to be heard in any judicial and administrative proceedings affecting the child” either directly or through a representative. How does the Centre become involved in a case? If you are involved in a case where a child’s interests need better representation, there are a number of ways you can connect the child with the Centre. Children and young people may contact us directly. Referrals can come from lawyers, social workers, court workers, teachers, or even directly from the Court. The Centre may assist the child without formal representation in court or may ask for a court order to provide full, formal court representation. The level of representation will depend on what the child needs in order to ensure that their voice is heard and considered. How does a lawyer get appointed under the Family Law Act? Where it is in the best interests of a child to be represented in family court proceedings, any party to the proceeding can apply under s. 203 of the Family Law Act for a lawyer to represent the interests of the child. If the court finds the test in s. 203 has been met and that it is in the child’s best interests, the court may appoint a lawyer for that child. The lawyer meets with the child to hear their views and preferences. The first interview with the child will usually be direct contact, with the meetings in person whenever possible. Where that isn’t possible, a Skype call is set up. Only where neither of those is a real option will the meeting with the child be by telephone. The relationship is a traditional solicitor client one; anything the young person tells the lawyer is privileged. The child will have multiple interviews with their lawyer to work out the relative importance to the child of their various preferences, and whether the child’s views change or remain consistent. The lawyer will often speak with important people in the child’s life—their teachers, coaches, counsellors, aunties and uncles, grandparents. All of this helps to add context to the child’s views and helps the lawyer to better advocate for the child. Like everyone else in the courtroom, the child has a chance to have their views presented, challenged, and then given due weight. The child doesn’t need to be at court for this; in fact, that rarely happens. This is very different from a “views of the child report” or other s.211 report that allows for information but not advocacy. And unlike a court ordered report that can take months to prepare, the services of the Centre are usually available without any significant delay. The Centre's lawyers will advocate for the child's views and preferences, while the role of the court is to determine whether those views and preferences are in the child's best interests. From the child’s perspective, the fact that someone is advocating on their behalf is key. These are early days but some of the feedback we have received is that it is an enormous relief for children to know that someone is going to bat for them. They understand that they may not get what they want, but they feel heard and empowered. Things that we think are small can be hugely important to them, while the “big rocks” that parents argue about are often very unimportant to them. We’ve heard that children are terrified when the police become involved in enforcement of parenting time—the descriptions of having a police officer show up at their school or their home to “arrest them” resonate. 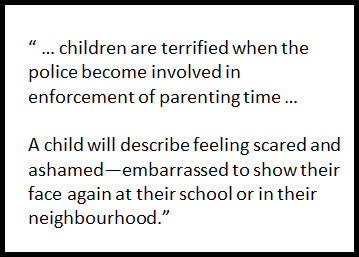 A child will describe feeling scared and ashamed—embarrassed to show their face again at their school or in their neighbourhood. The lawyer can assist by explaining this to the parents or the court. Orders often look very different when people appreciate the trauma the child is experiencing. Sometimes, the conflict between the parents is so severe, the children end up out of school because their caregivers can’t agree on what school they should go to. This isn’t an issue that can wait until trial—and children’s counsel has been able to resolve this and many other things along the way simply by listening and then advocating. In addition to family law services, the Centre will represent children in many other areas of law as long as counsel is not otherwise available. We assist in administrative matters, human rights, rights of children in care—just to name a few. 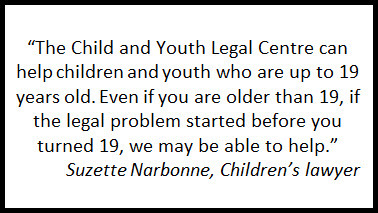 The Child and Youth Legal Centre is funded by The Law Foundation of British Columbia, The Law Foundation of Ontario- Access to Justice Fund, The Law Society of British Columbia, The Notary Foundation, and Representative for Children and Youth.